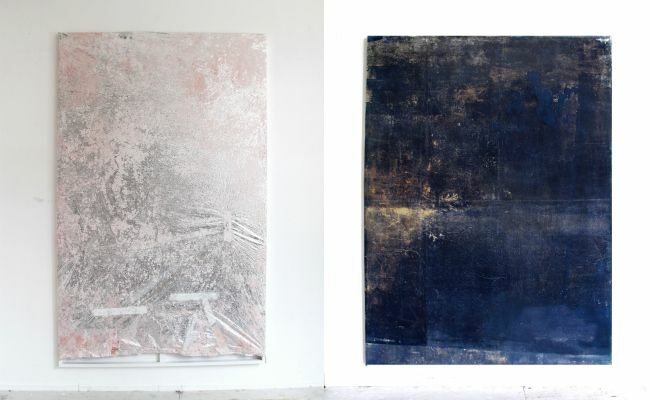 Jeremy Everett, No Exit 3 (left), 2014, Mixed media on mylar blanket. 205 x 132 cm. Auto Exposure #1 (rightl), 2013. Oil paint, cyanotype on canvas. 217 x 160 cm. Courtesy of the artist and Edouard Malingue Gallery. Hong Kong’s art scene is about to be hit with a wave of transience and enigma, as artist Jeremy Everett will soon be unveiling his solo exhibition, No Exit, at the Edouard Malingue Gallery. Everett, who began his artistic endeavors with an initial degree in landscape architecture, has always been fascinated by raw space and the bare earth. Much of his works are conceived by applying mixed media onto a mylar blanket, and each artistic creation has seen a world that extends beyond studio walls. To add to the work’s final lyricism, and to build onto its initial captivation, Everett places the pieces in environments such as the desert or the dry plains of his native Colorado. Everett’s works revolve around the idea that finality is never fully achieved, and are intended to beg the open-ended question of ‘what else do you see?’ This particular exhibition reveals how Everett’s vision is hypnotic, transcendental and disturbing while concurrently exposing a mesmerising quality, bidding you to open your mind and see in his works a vast range of possibilities.